When choosing a college, I had one determining factor. I wanted to go somewhere that would allow me an opportunity to play soccer on the collegiate level. After looking at several local colleges and universities, one of them decided to offer me a partial scholarship to play soccer! Not being the greatest player, I assumed it was a clerical error on their part and accepted the offer before they changed their mind. Now I could forever brag to my grandkids, that their granddad was so good that he got paid to play soccer. In my mind, I was like a professional. Who cares if the school was St. Mary’s school of the Blind? They wanted me to be on their team so badly, that they were willing to shell out $1000 per year for me to play. Back then, it seemed like a huge offer. I was wondering why we didn’t hold a press conference to announce the news to the world. Now, it seems like the equivalent of them offering me a Bojangles coupon to play. One of the things I liked best about the school was the coach. He was a good man, very funny, down to earth and very well connected in the world-wide soccer community. While coaching our private Division III school team, he was also doing some coaching for the U.S. Olympic Team. As a result, every once in awhile we would see an Olympic caliber star on the practice field with us. Deep down, I know the Olympic stud was excited to play alongside of professional players, like myself. College soccer is very different than high school ball or the many travel teams I played on. For one, it is more intense. It is way more competitive. Everyone is faster, stronger, better. I found myself consistently frustated that I never had time to prepare for a good pass, a good shot, a good chip. Everytime I had the ball, I was swarmed by an opposing player and rushed into doing something quicker than I wanted to. My coach noticed that I was not performing up to par and pulled me aside for some advice that has served me well, even in life – ever since. “Rod, take the shot. Don’t wait for it to be pretty or look just right. Just take the shot. You may not feel good about it – but some of them will go in.” He was right. I was waiting for the planets to line up. I was waiting for other players to roll out the red carpet to their goal and make it easy for me. It wasn’t going to happen – so I had to just “take the shot” whenever I had the opportunity. 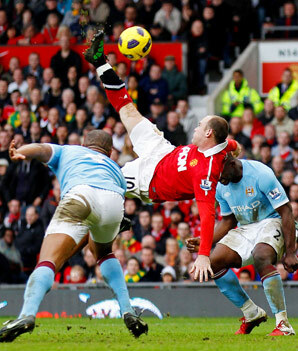 One of England’s best players, Wayne Rooney, taking the most difficult shot in soccer known as the “bicycle kick”. Life is alot like competitive sports. It is fast paced. It is intense. There is no time. Other people don’t make it easy. It is competitive and there are people out there who distract you from doing what you need and want to do. So, how do you do the things you want to do when you feel you don’t have time to do the things you need to do? You take the shot. If you want to paint, you begin part-time – after the kids are in bed. If you want to read more – you read that book, in 5 minute increments, in the bathroom if you have to. If you want to be better about reaching out to friends – you make that call while you are driving – even if the conversation is only 3 minutes long – it’s better than not connecting at all. You stay up late. You get up early. You watch less TV. You “take the shot” – even if you’re not 100% ready. It may not be perfect. It may not feel right but at least you are taking the shot and moving closer towards your goal. What shot do you need to take? What is keeping you from taking it? If you are waiting for the clouds to clear first, it will never happen. Take the shot. Start today. “You miss 100% of the shots you don’t take.” – Wayne Gretsky, Hockey legend.